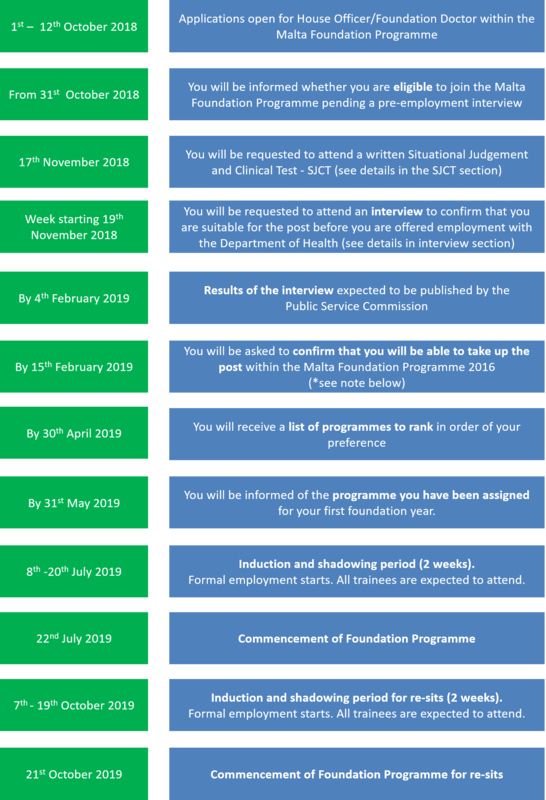 The expected Timeline for Recruitment into the Malta Foundation Programme 2019 is shown below. The Malta Foundation School will work hard to make sure that any changes which are beyond its control are kept to the minimum. More details on Recruitment 2019 may be found here. **UPDATE** Recruitment results expected to be publishd on the 8th February 2019. The Malta Foundation Programme (MFP) is affiliated to the United Kingdom Foundation Programme. As a result, the MFP is bound to streamline its recruitment process to that of the United Kingdom Foundation Programme Office (UKFPO), and conform to its rules and regulations. Until 2012, applicants to both UKFPO and MFP could decline allocated UKFPO posts after accepting to join the Malta Foundation Programme. This led to late withdrawals from the UK allocation process. In 2013 in agreement with the UKFPO, the Malta Foundation School changed the Timeline so that the names of applicants who accept their post on the Malta Foundation Programme will be notified to the UKFPO prior to allocation of applicants to programmes by the UKFPO for these applicants to be withdrawn from the UK FPAS. Applicants who are successful and accept the Malta Foundation Programme post will not advance further in the UKFPO allocation process. Applicants who are successful but decline the Malta Foundation Programme post will not retain their position in the Malta Foundation Programme.